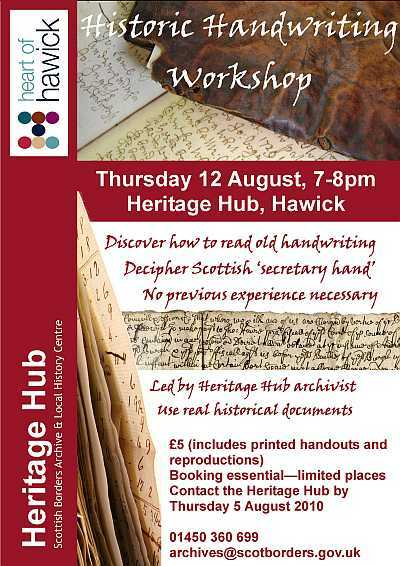 The Hawick Heritage Hub are running a workshop on reading old writing on Thursday 12th August, from 7 pm-8 pm. It's led by one of their archivists, and uses reproductions of real historical documents. The cost is £5 which includes printed handouts and reproductions. I think this is likely to be popular, so book early, and in any case, no later than Thursday 5th August 2010 on 01450 360 699, or see their poster for their email address. 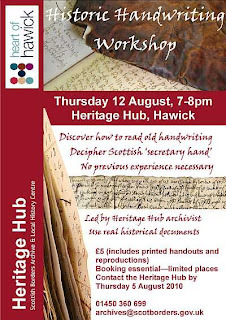 Please mention that you saw it advertised on the Borders Family History Society blog. There's no substitute for an experienced person discussing a document and helping you learn to understand the writing. However if you can't get to the course, look at http://www.scottishhandwriting.com for examples of writing and how to recognise the letters.